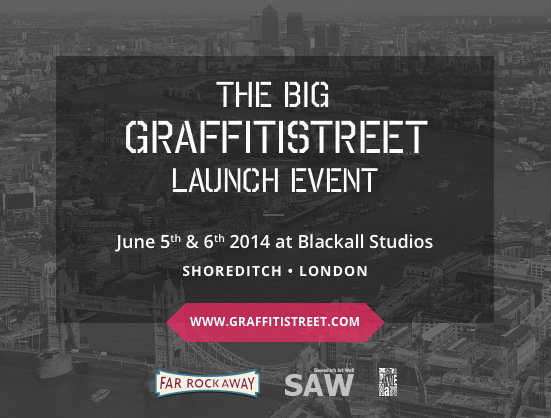 YOU ARE INVITED to join GraffitiStreet at the Blackall Studios, Shoreditch, London on Thursday 5th June and Friday 6th June between 6.30 p.m. And 10 p.m. to celebrate the launch of the newest Graffiti agency in London (see location map link below). This brand new online urban art store will be taking up residence on the vibrant streets of Shoreditch for two nights only. Step off Leonard Street and into the welcoming space that is Blackall Studios where their massively talented artists will have transformed it into a creative and colourful playground for aficionados of all things urban. All will be provided: beats, booze (it is a private viewing afterall) and some seriously mind-blowing live spray painting action taking place outside. Prepare to be wowed. So what of the art itself? You’ll be able to view a range of artist originals, as well as, three limited edition screen print releases created exclusively for GraffitiStreet. We’d like to think you wouldn’t want to miss this, so if you want to come and become part of the GraffitiStreet family, reply to rsvp@graffitistreet.com with your full name, and the date you wish to attend and get yourself onto the guest list. In the meantime, head on over to their site at www.graffitistreet.com and sign up to receive their newsletter for a regularly-updated smörgåsbord of the most delicious morsels that the urban art world has to offer. They’re also running an extra-special competition too. So if you haven’t entered already (it’s incredibly simple to do), you can find out more on graffitistreet.com. Rosh and Donna look forward to seeing you at the launch!